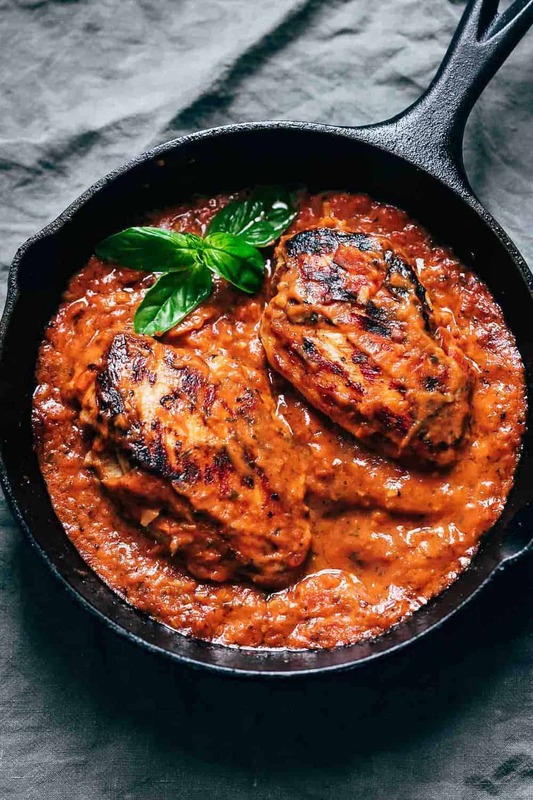 Creamy Tomato Basil Chicken is a simple, one pan meal that the entire family will love. With only five ingredients that are most likely in your pantry, this is an easy recipe that will become a dinner favourite! 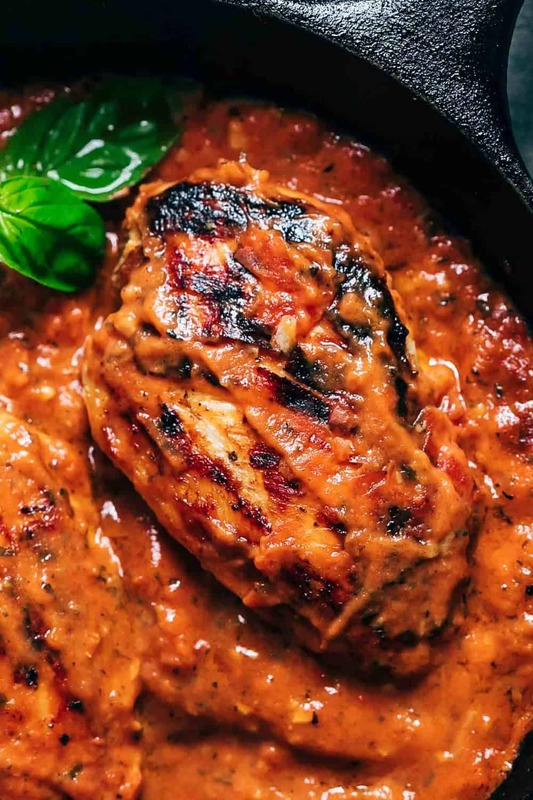 Lush and saucy is how I would describe this creamy tomato basil chicken. And the best part is how ridiculously simple it is to make. This recipe uses the most beautiful seasonal produce thats in abundance right now. 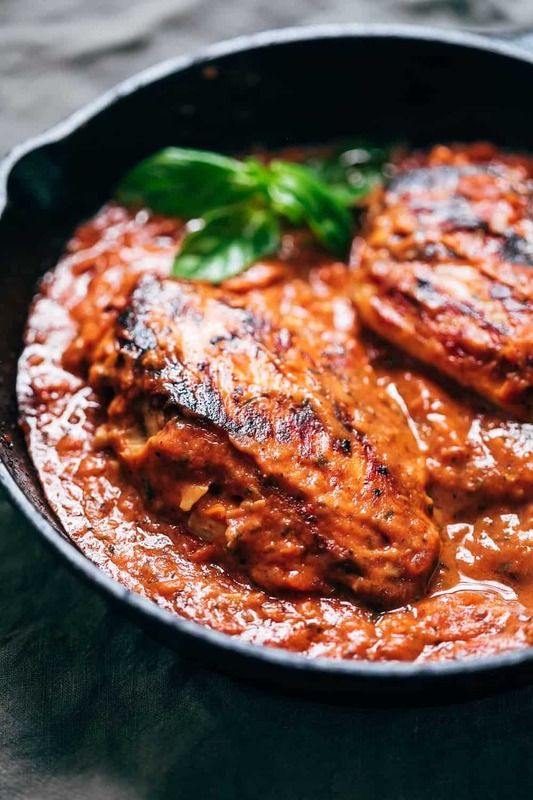 Fresh roma tomatoes, garlic and basil simmered in olive oil and butter till the tomatoes completely break down into a nice creamy consistency that coat every bit of the chicken. I like to add a little bit of cream towards the end to give this dish a luscious consistency. Since this is such a simple recipe, its really important to use quality ingredients. I prefer using chicken breast in the recipe because its lean meat and my family loves chicken breast! I like to start by adding some garlic to olive oil and warming it so that the oil is infused with the garlic flavour. Then the chicken breast is seared on high heat till its cooked through. Chicken breast doesn’t need too long – about 10 minutes in the pan and its done. The sauce is made in the same pan with diced roma tomatoes, cream and lots of basil. I finish this recipe with some cream to give it the beautiful creamy texture and add more flavour. If you don’t have access to good quality fresh tomatoes, just use a can of crushed tomatoes for the sauce. And you have the same recipe that takes even lesser time to put together. The recipe is so basic that this will become one of those recipes that you’ll make again and again. Serve this with pasta or rice. Add a little parmesan on top if you are feeling extra indulgent and you have a fantastic dinner thats ready in a jiffy! Add olive oil and garlic to a skillet and heat gently to infuse the olive oil with garlic flavour. Once the garlic is a light golden colour, season the chicken breasts on both sides with salt and pepper and slide them into the pan. Sear on both sides and cook for 10 minutes in the pan or till the chicken breast is cooked through. Take the chicken breasts out of the pan and place them on a plate. Add tomatoes and broth to the pan, along with salt and cook for 8-10 minutes till the tomatoes have broken down completely and are mushy and have formed a thick sauce. Add basil and cream and mix well. Add the chicken breasts back to the pan, simmer for two minutes and turn off the flame. Serve immediately. WOW! I made this tonight for our family and it was absolutely delicious! I added a few extra herbs and some extra garlic-I’m South Asian and we love our extra spices and garlic and such. I even added some sausage to the pan and let it soak up some of the sauce. But what a terrific recipe this was! Thank you so much for sharing. I’m following your blog as of now. How do you stop the garlic from burning? Mine was burned to a crisp within minutes when I had to turn up the heat for the chicken. I recommend turning the heat down lower and stirring occasionally to help avoid that.